Responsible for the content in accordance with § 10 Absatz 3 MDStV (German Law): Andreas Schömann. Forum contributions are solely in the responsibility of their respective members. Disclaimer: Despite carefully monitoring our content we accept no liability for the content of external links. Content of the linked pages are solely in the responsibility of their publishers. Note: this page contains the english translation of the german Impressum. Please note that we do not provide telephone support. This is a bugfix release (applies to OS X only). This is a bugfix release. 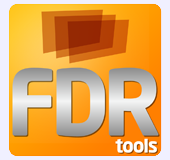 FDRTools Advanced is now also available as 64 bit version. It utilizes all the system memory and hence can process much larger images than was possible with the previous 32 bit versions.